To a genealogist, a cemetery is a great place to find out information about deceased relatives and ancestors. 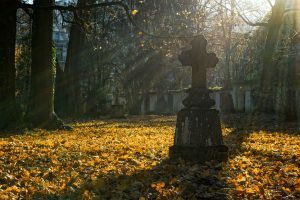 Taking photos of the gravestones of other people’s ancestors, and sharing them online, is a nice way to help out fellow genealogists who cannot travel to the cemetery. A trip to a cemetery may be exciting to a genealogist, but scary for someone else. How many of these cemetery superstitions have you heard of? Hold your breath as you pass by a cemetery. Breathing is an important necessity of life, and some believe that the breath would be an avenue for spirits to come and go. Holding your breath prevented you from inhaling a spirit. Whistling in a cemetery is a way of summoning evil spirits (or, alternatively, lonely spirits). Some believe that cemeteries hold lingering souls. Whistling might lure those souls to you, because whistling is a common way to call out to someone. In many cemeteries, graves are dug east to west. This could simply be to make it easier to efficiently use the space in the cemetery. That being said, there is a superstition that basically says that the reason graves are dug that way is so the deceased won’t have to turn around when Gabriel blows the trumpet during Revelation. There is a superstition about headstones. They are there to prevent the dead from rising too early. This superstition was held by the Europeans in the 1500s, whose religions included the idea that the dead would rise and be judged at the end of days. In some cemeteries, the headstone was placed at the deceased feet, to prevent them from getting up and walking away before Revelation. Mortsafes were installed over graves starting around 1770 and ending by the 19th century. There was a practical reason for this. Grave robbers would steal bodies. They would sell the stolen bodies to doctors, who needed them in order to learn about human anatomy. That being said, there was also a superstitious reason for paying for a mortsafe to protect your deceased loved ones. Many Christians at the time believed that there would be a physical resurrection of the whole body. They believed that a person could not enter heaven unless their body was intact.